Providence Homes is excited to announce that The Monroe model home, located at 124 Cross Ridge Drive in Greenleaf Village at Nocatee, is now available for sale with an April/May 2015 delivery date. This award winning ENERGY STAR® Certified Model home features 4,198 sq.ft. of living space, including 5 bedrooms, 4.5 baths, a 2-car garage, study, and extended family living area. The spacious foyer opens to all the gathering areas that include the formal dining room, kitchen and café, wine pantry, family room, as well as a covered patio that extends the open feeling. The Monroe offers plenty of relaxing living areas that appeal to a variety of lifestyles. You’ll love the owner’s suite and study, which are down a private hallway. The owner’s suite is spacious and features an ambassador spa bath that is a true oasis. The oversized walk-in closet is everything you’ve dreamed of – with a dressing vanity, built-ins and a private entrance to the laundry room. You’ll also find a pocket office at the café, a mudroom with utility cabinets, and a 2nd floor bonus room and full bath. Interior design elements include: - Upgraded ceramic tile flooring in foyer, dining room, study, family room, kitchen/café, pocket office, laundry, mud room, all bathrooms, extended family suite and hallways - Designer Executive Chef Kitchen w/ stacked 42″ cabinets & 21” Uppers w/ large crown molding and under cabinet lighting, granite countertops, GE stainless steel appliances w/ built-in cooktop, stainless steel hood, double oven and in-cabinet microwave - Ambassador Spa Owners Bath granite countertops, split vanity with vessel sinks, free-standing garden tub, large walk-in shower w/ 2 shower heads and upgraded tile design on throughout - Wine Pantry w/ granite countertops, tile backsplash to ceiling, wine racks and frameless glass enclosure - Extended Family Living Suite includes 42” cabinets, granite countertops, tile backsplash, sink, fridge and more - Upgraded molding and trim package throughout This plan also includes a ton of energy-efficient features: - ENERGY STAR® Certified Home. Ask about our $5,000 guarantee! - ENERGY STAR® appliances - ENERGY STAR® Vinyl windows w/ argon gas fill low-E glass - ENERGY STAR® Programmable thermostat - 2×6 exterior walls with R-21 Insulation - New innovative Open-Cell Spray Foam Attic Insulation - Incredible HERS “AS-Built” Index Score 52 - Estimated Average $139.00 per month total gas and electric bill - CFL lighting and fixtures If you’re interested in living in this incredible model home, call Melissa Meide Matthews at (904) 337-5236 for more details today! 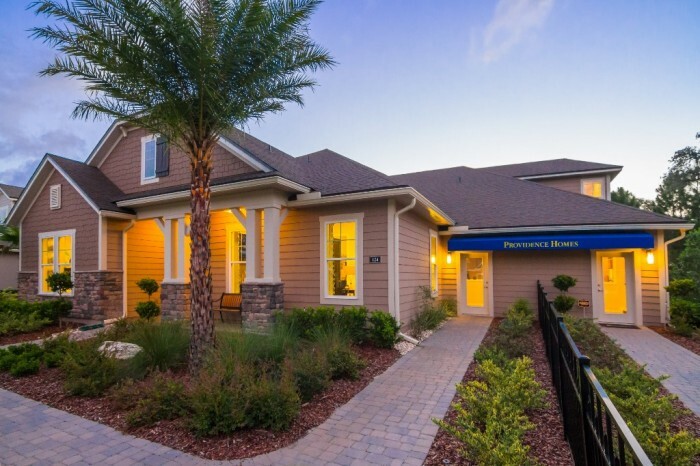 Providence Homes is Jacksonville, Florida’s hometown builder. As one of the area’s largest locally owned home builders, we are committed to building beautifully designed, 100% Energy Star certified homes at an affordable price. No matter which neighborhood you choose in Clay, Duval, or St. Johns County, Providence Homes has been a name families can trust as a Jacksonville new home builder for more than 20 years.